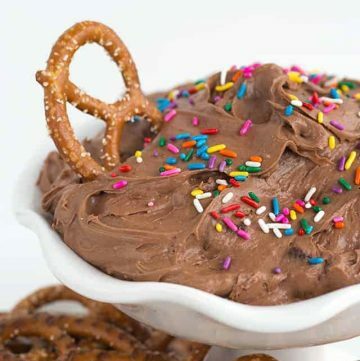 This brownie batter dip is a creamy, chocolaty dessert dip. The dip recipe only uses 5 ingredients and takes only minutes to make! Doesn’t that sound like something that needs to join any party food table, especially this Christmas eve? Love dessert dips? Check out my monster cookie dough dip! This is a sponsored conversation written by me on behalf of DairyPure®. The opinions and text are all mine. Christmas is right around the corner and Christmas parties are in full force. 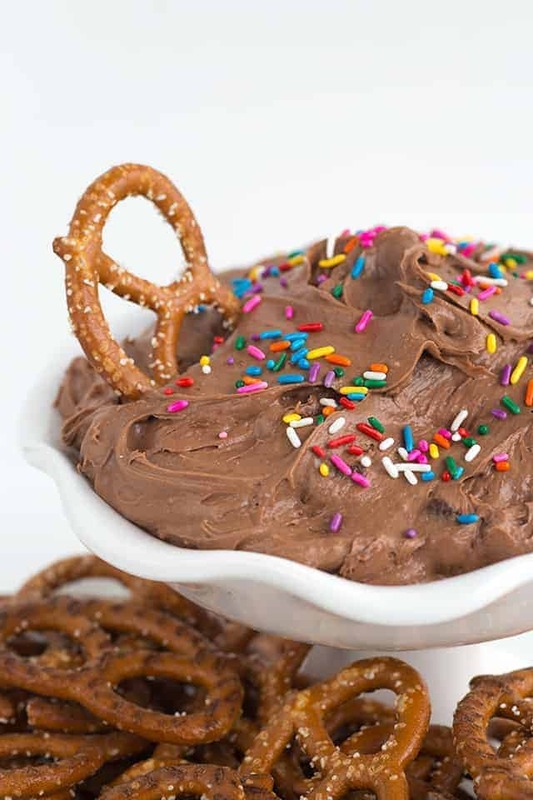 This is the dessert dip that people will be curious about and have to try. Everyone gets lured in by chocolate and sprinkles, right? Just me? Okay. 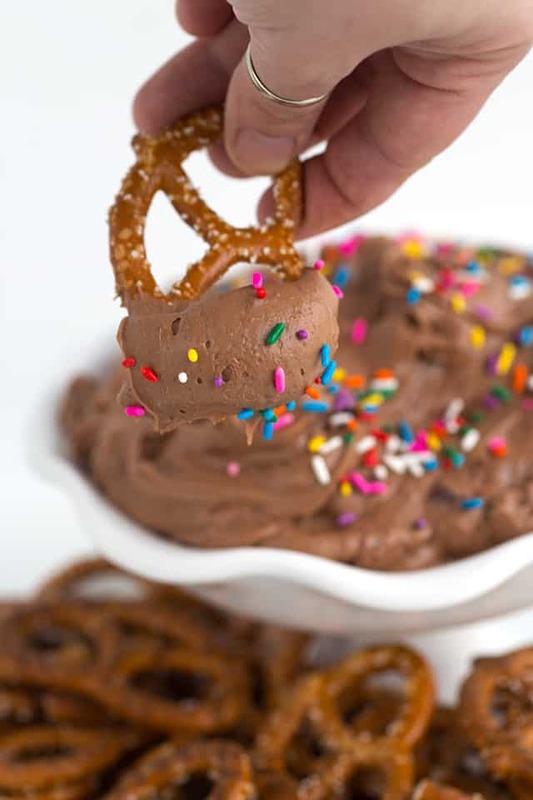 Serve the brownie batter dip up with pretzels too, because sweet and salty is a delicious combination. We normally only go to one party. Did I mention I’m still an introvert? We go to a Christmas party on Christmas eve at my parents. It was a tradition that we started when my grandma no longer could stay the night and wake up with us Christmas morning. It’s the perfect reason for us to make a table full of dips, cheese trays, and platters of cookies. Can you guess what I’m in charge of? Did you guess the cookies? Well, you’re right! I mean I am the author of the Easy Homemade Cookie Cookbook. It’s my claim to fame now! In fact, I’ve had a family member request that I ship her some cookies. I agreed even though I’m paranoid that they’ll arrive less than fresh. I need to get to making them soon. I even bought a cute little cookie tin to ship it in. Hopefully, they don’t arrive in crumbs or stale. DairyPure® has some of my favorite products to use. Have you checked out my peanut butter and jelly cheesecake I made using DairyPure® sour cream? It’s amazing! The whipping cream comes together so nicely too! The half & half is my new favorite coffee creamer thanks to my bestie getting me hooked! The list goes on! If you’re not a fan of the sweet and salty flavors, serve the brownie batter dip up with cookies or graham crackers instead of pretzels. My husband tested the dip with butter cookies over and over again and gives the stamp of approval. I mean he’s not my official taste tester, that’s my 6-year-old son, but his opinion is pretty legit. I have savory dips for appetizers too! 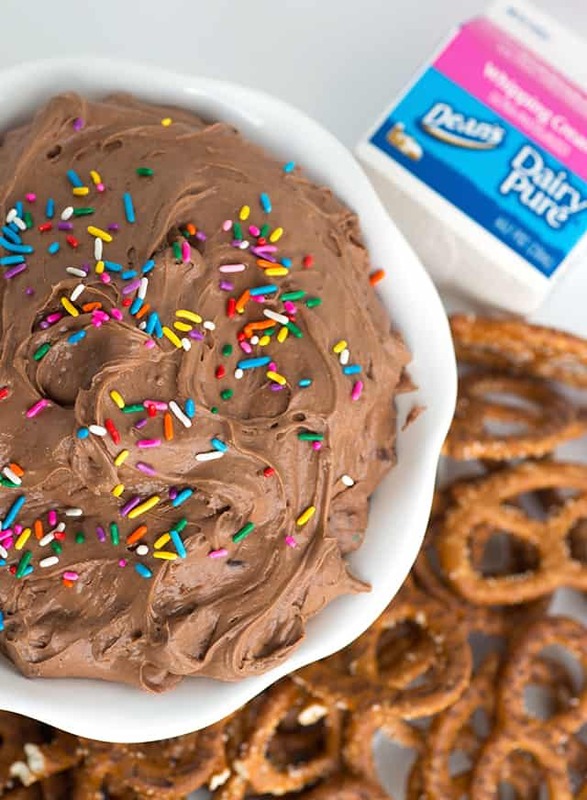 This thick and creamy brownie batter dip only has 5 ingredients and it's super simple to make! 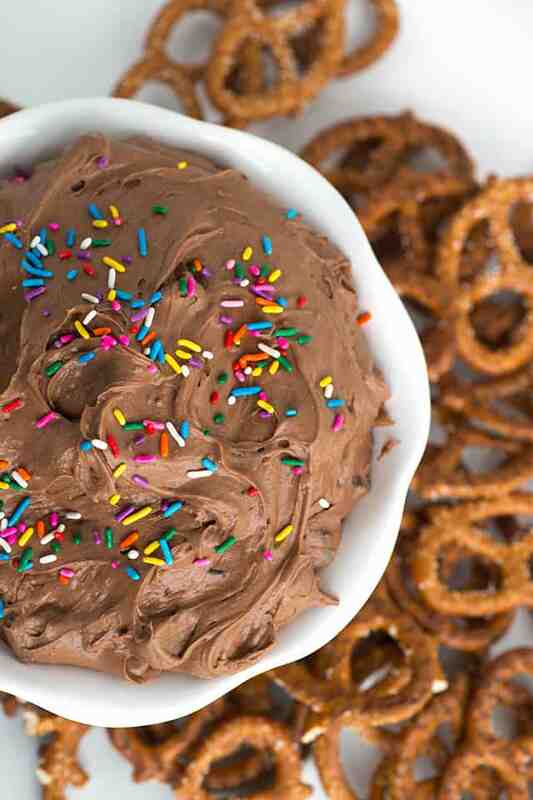 It's a great dessert dip for any party. In a large bowl, add whipping cream and beat until stiff peaks form. Set aside. In a separate large bowl, add in the dry brownie mix and cream cheese. Beat on medium for about 1 - 2 minutes. It may not come together yet. Add in chocolate syrup and beat on medium until the batter comes together into a ball. Add the whipped cream into the bowl with the stiff brownie batter. Beat until the brownie batter and whipped cream are incorporated and light in color. It should be pretty fluffy and creamy. Fold in the bits of brownie now if you choose to add them. Scoop the dip into a serving dish. Top with sprinkles and serve with pretzels, cookies, or graham crackers! My goodness, this dip looks incredibly delicious! This sounds super tasty and decadent. What a great dip to serve for a party! Let’s be honest, I’d probably enjoy this by myself on the couch in sweatpants too. Yum! Oh, I could eat this all day long. It looks so creamy and yummy! My kids would eat this up fast! Can I tell you how absolutely divine that chocolate dip looks??? Wish I had just a taste right now! Hubby would love this too. Pinning your recipe.